Psittacosis is a common and potentially serious disease occurring in both the birds that we keep and the humans that keep them, but there is still a lot that is misunderstood about the condition. I hope in this article to clarify some of those misconceptions, and to enable bird keepers to recognise and deal with the problem should it arise. The causal organism is called Chlamydia psittaci. It was temporarily renamed Chlamydophila psittaci, but the accepted name has now reverted to the original. The organism is found in a wide variety of birds and mammals, including man. This species is now sub-divided in to many sub-species, each affecting a different animal. For example, the type affecting cats produces mostly a conjunctivitis; that in sheep would cause an abortion; while in humans there is primarily a pneumonia. The organism producing a genital/venereal disease in humans is a separate species known as Chlamydia trachomatis. The blanket term for the disease produced by Chlamydia psittaci affecting all species is CHLAMYDIOSIS; if it occurs in a bird it is properly known as ORNITHOSIS; and when found in specifically psittacine birds it is termed PSITTACOSIS. This latter is the name with which we are more familiar, and it has by popular usage been stretched to cover the disease occurring in animals, including humans. The organism itself is unusual in that it has certain characteristics of bacteria - i.e. it is relatively large and is sensitive to antibiotics; but it also resembles viruses in that it can only grow and multiply within the cells of its host. The damage is then caused by the rupture of these cells and the release of toxins into the system. Chlamydia appear to infect and multiply in most types of cell, hence the widely variable disease pattern seen in different individuals or species. The organism will survive outside the host for approximately one month if protected by cell debris and protein material (i.e. droppings, nasal discharges). An important aspect of control of the disease is therefore cleanliness and disinfection to remove such debris. Efficient disinfectants are the quaternary ammonium compounds, benzalkonium chloride, and those that are formalin based. Thus the conventional fumigation of quarantine premises with formaldehyde gas (formalin and potassium permanganate) is very effective against this organism, provided surfaces have first been adequately cleaned. Natural occurrence of infection is world-wide and it is estimated that 1% of wild birds are infected and act as carriers. Many birds can hold the organism in their bodies in a latent state without showing signs of disease - these birds are carriers, and are a persistent risk to other birds - more later. This appears to be especially common in collections of budgerigars where infection rates have been reported as high as 30%. In the wild state, with birds living in equilibrium with their environment, the disease appears to cause little problem. It is only when outside pressures cause stress that illness strikes. Thus loss of food sources or habitat will precipitate disease, as will capture, transport, quarantine and re-housing. The disease is therefore most commonly encountered after recent importation or moving of premises. At this time, birds are stressed and weakened, the individuals carrying Chlamydia start to shed the organisms in their droppings and birds in these situations are often in closer confinement and proximity than in nature, and contagion occurs rapidly. The spread of infection is largely airborne in feather and faecal dust which is then inhaled by susceptible animals. A bird which looks perfectly bright and healthy to both seller and purchaser at the time of sale, but which is nevertheless infected as a carrier, could therefore become unwell with this disease after it moves to the new premises. Worse it could infect established birds in the new home if they have contact. The incubation period, (this is the time from infection with the organism to the onset of visible clinical signs) however, is extremely variable, and this can cause considerable confusion and distress when attempting to pinpoint a source of infection. The minimum interval is still being documented at 42 days, but it is possibly only 10 days. At the same time an infected bird will start shedding Chlamydia (thus passing on the infection) 10 days before it shows signs of illness itself, thus being a risk to adjacent birds while it still appears "healthy". The maximum incubation period is almost open ended, times from nine months to one and half years have been recorded. The legally controlled quarantine period for birds imported to the U.K. is 35 days. It therefore follows that a bird could be in contact with Chlamydia at any time during capture, transport and quarantine but could be well on the route to the wholesaler, pet shop or new owner before signs develop, and it is then difficult to confirm the source of infection. You may also have a carrier bird sitting in your collection for years until some stress, such as a change of diet, or rebuilding of flights etc. triggers the shedding of the organism, and then an outbreak can occur in a closed population, even if you have not bought in any new stock. British quarantine regulations are entirely for the purpose of controlling velogenic Newcastle Disease virus, which would be disastrous in the national Poultry Industry. Since this disease always presents within 35 days, this is the only limit set on the quarantine period. Compare this with mammalian quarantine, which is primarily to prevent the entry of rabies, and the incubation period of this virus can be 6 months. A bird that has been through quarantine then, contrary to popular belief is not guaranteed to be free of psittacosis, for the reasons explained above. Quarantine stations in the U.S.A. by law medicate all birds with Tetracycline antibiotic during their stay in an attempt to control psittacosis. Some importers in this country do likewise, although they are not obliged to do so. Even this technique does not reliably eliminate the disease for reasons that will become clear when we discuss treatment. Clinical signs are many and variable, depending on species involved, and the intensity of the infection. Cockatiels and Neophema parakeets will often exhibit a persistent conjunctivitis and blepharitis (sore eyes with swollen eyelids) that does not respond to treatment, but with few other clinical signs. Very susceptible birds may be found suddenly dead, but the classical clinical picture is the 'sick parrot', with depression, ruffled feathers, loss of weight, inappetance, diarrhoea and respiratory symptoms. 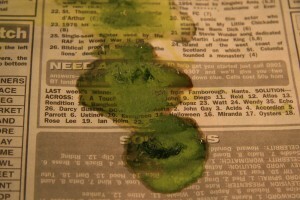 The latter usually include thick nasal discharge with a sneeze; and the diarrhoea is typically bright fluorescent green. It seems that the initial condition of the bird when infected and the size of the infective dose is more important to the progress of the disease than is the species of the bird involved. The difficulty of making a clinical diagnosis, however, is that not all these signs may be present, and conversely there are many other systemic infections which can produce a similar picture. Accurate diagnosis must be supported by further laboratory tests, and herein lies more difficulty, in that most tests take time to achieve a result, often too late for the bird; or the tests themselves are not conclusive. Blood samples will only demonstrate antibodies, which mean the bird has been exposed to Chlamydia at some time. To be meaningful, a repeat sample in 10-14 days must show a 'rising titre', which is an increasing reading suggestive of recent infection. The actual organism may be identified in a blood sample, but only when it is going through a phase of multiplication. 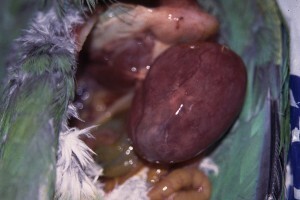 This period is limited, and a negative result would not mean that the bird does not have the disease. The ideal test is to culture the organism from dropping samples or cloacal swabs or even post-mortem material, but again there are problems in maintaining the organism alive for long enough while samples reach the laboratory, plus the fact that in mild cases or carrier birds, the organism is not passed out in the droppings all the time. There are other tests available for detecting Chlamydia antigen in faeces, like ELISA (Enzyme Linked Immunosorbent Assay), and this will provide quicker results on samples that contain the organism but again a negative test result does not necessarily mean that the bird is free of psittacosis; it may just not be excreting at the time of the sample. Other tests developed include Latex Agglutination (LA) and Direct Fluorescent Antibody (FA). The recent availability and now the far more accurate test of PCR technology using Chlamydia psittaci - specific DNA probes has proven to be the most effective method of identifying positively infected birds. Post-mortem examination (autopsy) is perhaps the most reliable method of achieving a positive diagnosis. Typical signs found are enlargement of the liver and spleen, and inflammation of the membranes of the air sacs, heart and peritoneum (serositis). These signs can also be produced by other septicaemias, but impression smears taken from the pericardium, liver and spleen, stained in a special way and examined under the microscope, will demonstrate Chlamydial organisms in infected cells. The PCR test will also identify organisms present in the carcase. Once the problem of making a positive diagnosis is overcome, one then has to face the next dilemma of treatment. One must first decide whether or not to treat at all, depending on the circumstances, and then we have to choose the right medication for a long enough period. There is a strong case to argue that a bird affected with psittacosis should be put to sleep, since the disease is highly contagious, difficult to eliminate and a threat to human health. Thus in the quarantine or pet shop situation, where many other birds are involved, and infestation can be difficult to eliminate from a premises it is perhaps wiser to cull infected birds. This should be followed by a regime of disinfection and testing for carrier birds (subject to the limitations described above). On the other hand, when the patient is a much-loved pet, and especially where symptoms are not severe, treatment can be attempted. One must take into account the human risk element; if there are young people in the household, or people with breathing difficulties such as asthma or bronchitis, then it should be considered wiser to put the bird to sleep rather than risk the lives of such people. If we may digress here to discuss the disease as it affects humans; we have already stated that Chlamydiosis affects most mammals and birds, and in species like parrots, cattle, sheep and goats, the organism is highly contagious from one individual to another. In dogs, horses and humans however, so far as I am aware these species are at the end of an infection chain. This means that although we can acquire infection from diseased birds, we cannot pass on that infection to either other birds or other people. (This is at least applicable to the organism Chlamydia psittaci; there is another species Chlamydia trachomatis which is a specifically human pathogen that causes respiratory and genital disease). Symptoms of 'psittacosis' in humans resemble those of severe 'flu' but particular signs are head and neck pain, fever, aching joints, chest tightness and pain, and a dry cough. Provided precise diagnosis is made quickly enough, treatment with Tetracycline, Azithromycin or Erythromycin usually produces a rapid response. However, if the illness is confused with 'flu or pneumonia, and appropriate therapy is not instituted for a while, the disease can progress rapidly, and deaths have been recorded. The risk is greatest in the old, young or those with chronic breathing difficulties. Recovered individuals may have some permanent weakness in the lungs or heart. Although antibodies to the organism can be detected in the blood of both birds and humans, these merely indicate exposure to infection, and apparently they have little protective effect. Thus there is no lasting immunity produced, and individuals (avian and human) can be re-infected almost as soon as they have recovered, if exposed to the organism again. For similar reasons, there is at present no way of vaccinating to prevent the disease, because of the lack of any ability to stimulate immunity. To return to treatment:- the drug of choice on the whole is one of the Tetracycline group, to which the Chlamydial organism is sensitive. However, the drug has to be administered in a form which produces an effective dose for a sufficient treatment period. The antibiotic will act only on the organisms when they are growing and multiplying, and since the Chlamydia can exist dormant in cells for some time, the drug will be useless at these periods. It is therefore recommended that medication be sustained for a minimum of 35-45 days to be effective in eliminating the infection. Treatment for shorter periods of 5-10 days will often produce a rapid clinical improvement, but the bird is not cured, and can either relapse into disease, or remain a carrier to transmit infection to other stock. This prolonged use of antibiotic can itself pose problems of imbalance of the normal intestinal flora, producing diarrhoea and malabsorption conditions, or secondary infection by opportunist fungi or yeasts. There may also be some immuno-suppressive effects to the drug; and it can be difficult to maintain therapeutically effective levels of the tetracycline within the cells. Tetracycline also reacts with calcium in the diet to limit its absorption, so birds have to be given low levels of calcium during the treatment period, otherwise the antibiotic is useless. The choice of tetracycline type and its route of administration is the next problem posed. Obviously when a flock is involved, it is much easier to medicate in bulk orally, through feed or drinking water. The difficulty here is that water soluble forms of tetracycline (eg. chlortetracycline, oxytetracycline) are fairly unstable, and will lose their potency very quickly unless solutions are changed regularly. Also there is the difficulty of ensuring that the birds take in enough to be therapeutically effective. In the USA there are available seeds and pelleted feeds that are impregnated with CTC. These can be more effective than water medication, provided the birds take the diet. Fussy eating or even starvation can result when birds will not co-operate. a) 'Terramycin LA' - a long-acting oxytetracycline. This is effective if given every 5 days, but often damages the muscles. The damage is reversible, but is nevertheless an unpleasant side-effect. b) Doxycycline ('Vibramycin') is more efficient, but can also cause some muscle damage. Doses should be given at 7,7,7,7,6,5 and 5 days through a 45 day period, since the drug becomes more rapidly excreted as the bird becomes used to it. An oral preparation of Doxycycline is available ('Vibramycin syrup'), and this is probably preferable for the single, handleable, pet bird. Currently, there has been success in the treatment of psittacosis using the newer quinolone antibiotics, such as enrofloxacin ('Baytril'). This drug is more palatable and stable in the drinking water, and the injectable form is less likely to produce muscle damage than are the tetracyclines. It appears also that cure rates may be obtained in 14-21 days. However, there is evidence to suggest that apparent 'cures' are in fact just clinical improvements with the birds still remaining infected acting as carriers. In summary, therefore, we may say that psittacosis is a disease that has long been recognised, and is yet still not fully understood. The clinical picture is variable; incubation period can be exceptionally long; carrier birds complicate the epidemiological picture; and precise diagnosis can be difficult and prolonged. Treatment is available and can be effective if instituted correctly, but the decision on whether to treat must be carefully made, depending on the birds involved, the environment and the risk to humans. Any person associated with birds who develops 'flu-like symptoms should always alert his/her doctor to the avian connection, and therefore the possibility of psittacosis, in order to allow an early diagnosis to be made. Hygiene, disinfection, quarantine and isolation of all new stock are of paramount importance in controlling the disease. As yet, the diagnostic tests available do not enable screening and culling programmes to be 100% effective, but hopefully continued vigilance and monitoring of breeding flocks and birds in quarantine will finally reduce the incidence of this nuisance disease.